Bugattis at Pikes Peak continues Didur’s characteristic use of rich colours and his meticulously detailed work. It also reflects his fascination with exotic locations. In this work, instead of showing a pyramid mysteriously plunked down in the middle of the prairies, we are presented with racing cars competing in one of the oldest automotive races in America, the annual Pikes Peak International Hill Climb. And not just any race cars, but the prestigious - and expensive - Bugatti automobiles. Why Bugatti? Because, Didur says, he’s always loved them. (Conversation with the artist, January 9, 2008). Pikes Peak, located near Colorado Springs, Colorado is one of the most picturesqueIn general, this may refer to any scene which seems to be especially suitable for representation in a picture, especially that which is sublime. It is especially associated with an aesthetic mode formulated in the late eighteenth century which valued deliberate rusticity, irregularities of design, and even a cultivated pursuit of quaint or nostalgic forms. Such pictures became common in nineteenth century Europe and America. Examples can be found among the American painters of the Hudson River school â€” Thomas Cole (1801-1848), Jasper Cropsey (1823-1900), and Asher B. Durand (1796-1886) â€” and of the Rocky Mountain school â€” Albert Bierstadt (1830-1902) and Thomas Moran (1837-1926). (artlex.com) mountains in the Rockies. It is said that Katherine Lee Bates, the woman who wrote the lyrics to “America, The Beautiful” was inspired to complete the last verse after viewing the surrounding country from the top of Pikes Peak. In Didur’s version of the annual “Race to the Clouds”, the mountain’s 156 irregular hairpin turns and switchbacks - a major challenge for drivers and their vehicles - have been replaced by a neat collectionTo collect is to accumulate objects. A collection is an accumulation of objects. A collector is a person who makes a collection. (Artlex.com) of symmetricalFormal balance where two sides of a design are identical. lines leading toward the summit, which is shrouded in cloud. During a conversation about the work, Didur said the original idea for the mountain came from an oval dining-room table that he was repairing. “The two half-ovals leaning against the wall looked interesting, so I decided to see what I could do with them. I mounted them to a piece of plywoodA type of manufactured wood made from thin sheets of wood veneer. and the idea developed from there. The clouds at the top of the mountain are pieces of StyrofoamA trademark used for expanded polystyrene plastic, a light-weight, granular material, usually worked in sheets or blocks, but also available in loose granules. It can be cut with great precision and ease with an electrically heated wire. Styrofoam is an economically attractive medium for use in theater and motion picture stage sets. Styrofoam is often mentioned in print as [lower-case s] styrofoam. (Artlex.com) covered with plaster.” Zoom in to the Didur image and take a closer look! Drivers’ reflexes and muscle strength deteriorate in the thinning air, and the racing course turns from pavement to gravel halfway up. At one turn – called the “Bottomless Pit” – racers must negotiate the turn or face a 1,830 metre (6,000 foot) drop off the edge (see image of Pikes Peak at left). Drivers have to be in peak physical condition just to finish the race, let alone win it! Those Ghost Pyramids…I mean its been known for lots of years, a long time, that these symbols of the prairies are disappearing - the grain elevator. And I had been well, I guess in one of my travels in the countryside or something like that …I just remembered seeing a group of elevators together and as I was approaching them thinking that the way they were spaced and placed next to one another, because there would be out buildings and then you would have the things, and it almost looked like a pyramid. And I thought - and that was actually something that I just stored in my head. I had probably seen it years before and I had always kept it in the back of my mind and somehow…how can you use this? And then the opportunity came up to be able to do it. It’s mostly again about not only the fact that the elevators are disappearing, it’s going to disappear completely - there will always be a rural Saskatchewan. There will always be a rural Oklahoma, a rural France. But the fact is that it is changing and parts of it are disappearing. And what will inevitably happen is they are going to save one grain elevator - the old styleA way of doing something. Use of materials, methods of working, design qualities and choice of subject matter reflect the style of the individual, culture, movement, or time period. grain elevator - and have it as a historic monument because they are all going to be those inland terminals which have the potential of being something in the future for somebody. But it was mostly about that and, I mean, I just like the idea of the pyramid and that sort of thing. You know how the pyramids have had such longevity, something that has been around for thousands of years but the knowledge that the grain elevator will probably not be around for thousands of years. I actually decided to go into art right out of high school. We didn’t have art classes at the high school I went to in Saskatoon, and they had a BFA program that they had an article about in the paper. I was going to go into art history because I liked history. Well I went down there, talked to the people and they said, how many languages do you speak? And I said “English.” And they said, well, we would like you to have at least two languages if not three that you can speak. And the guy said, how would you like to take some studio classes so I said “works for me” so I started taking art classes. So I started off taking a couple art history classes, a couple studio classes and whatever else they had out there. I got into sculpture. I took classes from a guy named Bill Epp. Bill was a terrific teacher he was a wonderful person and did some nice work and I always liked Bill when I was there. In my second year of university, I started taking ceramics. I took a clayMud; moist, sticky dirt. In ceramics, clay is the basic material, usually referring to any of a certain variety of mixtures of such ingredients — fine-grained, firm earthy material that is plastic when wet, brittle when dry, and very hard when heated. There is a temperature with ceramic clays at which their particles fuse (vitrification), and this is most commonly controlled by heating (firing) them in a kiln. The most common types of ceramic clays are earthenware (terra cotta when fired, terra cruda when not), stonewares, and porcelain. (Artlex.com) class, because I thought it was related to sculpture, that was from a guy named Jim Thornsbury. He was an American guy that came in from Washington, and he was actually involved in a movement called the FunkAn art movement in the 1950’s and 60’s that grew from a reaction against abstract expressionism. In California, the Funk Art movement was embraced by clay artists who were instrumental in moving clay from it’s traditionally functionally role to that of a sculptural art form. Artists often combined a play on words (puns), the popular culture and their own environments as inspiration for their often humorous imagery. movement from the west coast, of funny ceramics. And this guy was totally turning our department on its head because his attitude towards art was totally different, which I really liked. So I began focusing on clay. The first time I took a paintingWorks of art made with paint on a surface. Often the surface, also called a support, is either a tightly stretched piece of canvas or a panel. How the ground (on which paint is applied) is prepared on the support depends greatly on the type of paint to be used. Paintings are usually intended to be placed in frames, and exhibited on walls, but there have been plenty of exceptions. Also, the act of painting, which may involve a wide range of techniques and materials, along with the artist's other concerns which effect the content of a work. (Artlex.com) class was in my last year…summer school intersession. I took a paintingWorks of art made with paint on a surface. Often the surface, also called a support, is either a tightly stretched piece of canvas or a panel. How the ground (on which paint is applied) is prepared on the support depends greatly on the type of paint to be used. Paintings are usually intended to be placed in frames, and exhibited on walls, but there have been plenty of exceptions. Also, the act of painting, which may involve a wide range of techniques and materials, along with the artist's other concerns which effect the content of a work. (Artlex.com) class from a guy named Stan Day who just let me do what I want. He didn’t ask me to do anything. He just says go ahead and paint away and do what you want, which is really nice. And then after that, after I finished school, I didn’t do any art for two maybe three years after that. I worked and just got away from the whole thing. In 1979 I moved to Regina, and when I moved to Regina I moved into an apartment and of course it didn’t have any place to do ceramicsPottery or hollow clay sculpture fired at high temperatures in a kiln or oven to make them harder and stronger. Types include earthenware, porcelain, stoneware, and terra cotta. (Artlex.com) because you need a place you can get dirty…you need all these physical requirements which you don’t have in an apartment. So I went and I had some paints left over from that paintingWorks of art made with paint on a surface. Often the surface, also called a support, is either a tightly stretched piece of canvas or a panel. How the ground (on which paint is applied) is prepared on the support depends greatly on the type of paint to be used. Paintings are usually intended to be placed in frames, and exhibited on walls, but there have been plenty of exceptions. Also, the act of painting, which may involve a wide range of techniques and materials, along with the artist's other concerns which effect the content of a work. (Artlex.com) class, so I decided I would just try my hand at painting, and that’s when I started doing it. The school I went to, the University of Saskatchewan, did not have the painters there. There was sort of the Saskatoon school of paintingWorks of art made with paint on a surface. Often the surface, also called a support, is either a tightly stretched piece of canvas or a panel. How the ground (on which paint is applied) is prepared on the support depends greatly on the type of paint to be used. Paintings are usually intended to be placed in frames, and exhibited on walls, but there have been plenty of exceptions. Also, the act of painting, which may involve a wide range of techniques and materials, along with the artist's other concerns which effect the content of a work. (Artlex.com) where there were either abstractImagery which departs from representational accuracy, to a variable range of possible degrees. Abstract artists select and then exaggerate or simplify the forms suggested by the world around them. (Artlex.com) painters or landscapeA painting, photograph or other work of art which depicts scenery such as mountains, valleys, trees, rivers and forests. There is invariably some sky in the scene. (Artlex.com) Landscape is also a term that may also refer simply to a horizontally-oriented rectangle, just as a vertically-oriented one may be said to be oriented the portrait way. (Artlex.com) painters, neither of which I liked very much. Whereas one intersession class a guy named David Thauberger from Regina came up to Saskatoon and taught an intersession class in pottery. I just sort of hung out around the studio, at that time…not really liking to work for my living - I liked to hang out around the studio more. I met him and he used to show slides of his paintings to his pottery students paintings from guys from California, like William Wyllie and Joseph Raphael or the Chicago Who group which would be Jim Nutt, Gladys Nillson and Roger Brown, Art Green, just a pile of these guys did kinds of paintings that I had never ever seen before and didn’t even know existed. And that was when I really started getting interested in paintingWorks of art made with paint on a surface. Often the surface, also called a support, is either a tightly stretched piece of canvas or a panel. How the ground (on which paint is applied) is prepared on the support depends greatly on the type of paint to be used. Paintings are usually intended to be placed in frames, and exhibited on walls, but there have been plenty of exceptions. Also, the act of painting, which may involve a wide range of techniques and materials, along with the artist's other concerns which effect the content of a work. (Artlex.com) when I saw what other people were doing other than what the people in Saskatoon were doing. This is my Trojan Sentinel and what it is, is poplar wood, and done with mortis and tenon joints. And then joined together. So it’s all just little sticks of wood and then painted up and this thing is as solid as the rock of Gibralter - it won’t move around. But the thing that is really quite neat about this thing is that it actually sounds good too. And we are going to go for a ride (rolls Trojan Sentinal across the floor). Think of ancient Troy and you are sitting there and you are guarding the castle or the fort and then all of a sudden this is the noise you hear coming up to your castle. I had no idea that this was going to do this - I just thought I should put some back-up beepers on this thing. We can pop a wheelie. Being an artist sometimes means you just don’t have to grow up…sometimes it is just fun to play around. Here we go! Rollin’, Rollin’, Rollin’! When I first started painting, I mean, it was quite exciting learning how to use paint, because I really didn’t have a lot of knowledge about it. I just liked things that were big and bright, so I made paintings that were big and bright. Basically I’m using two different things, I’m using either something really big, and in particular, paint rollers that you paint houses with, and I blend a lot of my colours in using paint rollers. And then I use foam pad brushes too for a lot of it. But then about 90 percent of the actual time I spent on a paintingWorks of art made with paint on a surface. Often the surface, also called a support, is either a tightly stretched piece of canvas or a panel. How the ground (on which paint is applied) is prepared on the support depends greatly on the type of paint to be used. Paintings are usually intended to be placed in frames, and exhibited on walls, but there have been plenty of exceptions. Also, the act of painting, which may involve a wide range of techniques and materials, along with the artist's other concerns which effect the content of a work. (Artlex.com) was spent with a little thing called a long-liner brush, which has, the brush part of it is probably the thickness of a pencil lead. And it’s lots of little strokes and lots of layers of colours on top of one another, and you go over it again, and again, and again. And, like I say, in the beginning it was really exciting and interesting, but towards…it didn’t take that many years before it started to get tedious, and the whole paintingWorks of art made with paint on a surface. Often the surface, also called a support, is either a tightly stretched piece of canvas or a panel. How the ground (on which paint is applied) is prepared on the support depends greatly on the type of paint to be used. Paintings are usually intended to be placed in frames, and exhibited on walls, but there have been plenty of exceptions. Also, the act of painting, which may involve a wide range of techniques and materials, along with the artist's other concerns which effect the content of a work. (Artlex.com) thing did not…really became a chore for me to sit there and go into the studio and paint because I knew what I was going to be doing, and I knew how time consuming it was, and you just sort of sit there…I used to have a TV on all the time while I painted to keep me entertained because it was so boring. I was actually already taking quite a bit of flack because a lot of artists, their shows will be basically around the same theme again and again and again. Like Joe with his cows, and David with his houses and that, and I was getting flack because I’d have a show of fish, and then my next show would be of Japanese gardens, and then my next show would be of the Rainbow Sentinels, and it would be like that. And I was getting flack from people because I wasn’t keeping up to the same theme over and over again. Well, that would have made paintingWorks of art made with paint on a surface. Often the surface, also called a support, is either a tightly stretched piece of canvas or a panel. How the ground (on which paint is applied) is prepared on the support depends greatly on the type of paint to be used. Paintings are usually intended to be placed in frames, and exhibited on walls, but there have been plenty of exceptions. Also, the act of painting, which may involve a wide range of techniques and materials, along with the artist's other concerns which effect the content of a work. (Artlex.com) even more boring than it already was. I mean, the actual process was…the fun part of paintingWorks of art made with paint on a surface. Often the surface, also called a support, is either a tightly stretched piece of canvas or a panel. How the ground (on which paint is applied) is prepared on the support depends greatly on the type of paint to be used. Paintings are usually intended to be placed in frames, and exhibited on walls, but there have been plenty of exceptions. Also, the act of painting, which may involve a wide range of techniques and materials, along with the artist's other concerns which effect the content of a work. (Artlex.com) was actually thinking up the ideas. Maybe I would have stuck with it if I could have just got somebody to paint them for me. And I could have just sat back and said “well I’ve got this really neat idea” done one of my five-minute drawings, and then gone out golfing for the rest of the day. Now that would be my idea of being an artist. Didur found an interesting idea worth pursuing in a table in need of repair. What everyday items might inspire you or others to create something new? Why do you think everyday items can be inspiring to artists? 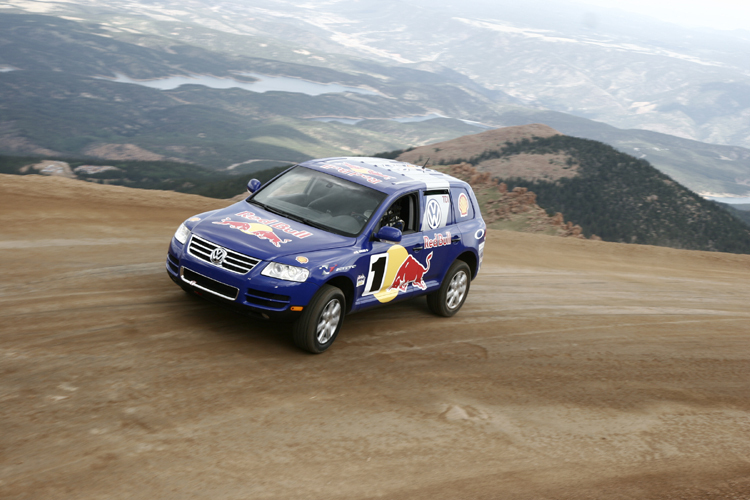 How does the Pikes Peak Hill Climb embody the idea of Conflict? Read some more about this event and look at pictures of it. What kind of conflicts and struggles do you think the drivers encounter? Can you think of other events that involve Conflict (for example, a war, a discussion/debate, etc.)? How might you portray the idea of Conflict in a piece of visual art? Why do you think an artist may stop paintingWorks of art made with paint on a surface. Often the surface, also called a support, is either a tightly stretched piece of canvas or a panel. How the ground (on which paint is applied) is prepared on the support depends greatly on the type of paint to be used. Paintings are usually intended to be placed in frames, and exhibited on walls, but there have been plenty of exceptions. Also, the act of painting, which may involve a wide range of techniques and materials, along with the artist's other concerns which effect the content of a work. (Artlex.com) or making art for a period of time as Didur has? What might influence this kind of a decision? You might be surprised to know that artists have been fascinated by optical illusionAn image that deceives a person, leading to a misinterpretation of its meaning. Optical illusions can be found in nature as well as in art. Their strengths rely upon various assumptions in which humans perceive optical phenomena. (artlex.com) For some examples, go to: Optical Illusions and Visual Phenomena: http://www.michaelbach.de/ot/ The World of Optical Illusions: http://www.newopticalillusions.com/ NIEHS Kids Page – Optical Illusions: http://kids.niehs.nih.gov/illusion/illusions.htm in various forms for many centuries. Check out the following optical illusions, and then try to find examples of your own. Optical Illusions at Google Images. The advent of three-point perspectiveA method used to create the illusion of space on a two-dimensional surface. It can be created by overlapping, placement, detail, colour, converging lines and size. See HandPrint.com (http://www.handprint.com/HP/WCL/perspect3.html and http://www.handprint.com/HP/WCL/perspect4.html) for some examples. - when artists in the RenaissanceA revival or rebirth of cultural awareness and learning that took place during the fourteenth and fifteenth centuries, particularly in Italy, but also in Germany and other European countries. The period was characterized by a renewed interest in ancient Greek and Roman art and design and included an emphasis on human beings, their environment, science, and philosophy. (Artlex.com) discovered how to represent the illusionA deceptive or misleading image or idea. (Artlex.com) of spaceSpace can be the area around, within or between images or elements. Space can be created on a two-dimensional surface by using such techniques as overlapping, object size, placement, colour intensity and value, detail and diagonal lines. on a flat surface. Create a soundtrack for Didur’s painting. In this activity you have several sounds to choose from - a car horn, the revving of a car's engine, the wind rushing past, the sound of a drum, and the sound of a jazz saxophone. Now, look at the Didur paintingWorks of art made with paint on a surface. Often the surface, also called a support, is either a tightly stretched piece of canvas or a panel. How the ground (on which paint is applied) is prepared on the support depends greatly on the type of paint to be used. Paintings are usually intended to be placed in frames, and exhibited on walls, but there have been plenty of exceptions. Also, the act of painting, which may involve a wide range of techniques and materials, along with the artist's other concerns which effect the content of a work. (Artlex.com) again, and think about what it might sound like. To create your soundtrack, first, click on the shapes below to choose the sounds you want to use in your soundtrack. They will appear in the "keyboard" below in the order in which you click on them (note that you can click on the same sound more than once!) If you are not happy with a sound, just click on "delete" to delete it from its place on the "keyboard". Then, click on “play” to hear how your soundtrack sounds! You can pause the playback of your soundtrack at any time. Trompe l’oeil paintingWorks of art made with paint on a surface. Often the surface, also called a support, is either a tightly stretched piece of canvas or a panel. How the ground (on which paint is applied) is prepared on the support depends greatly on the type of paint to be used. Paintings are usually intended to be placed in frames, and exhibited on walls, but there have been plenty of exceptions. Also, the act of painting, which may involve a wide range of techniques and materials, along with the artist's other concerns which effect the content of a work. (Artlex.com) is often associated with RenaissanceA revival or rebirth of cultural awareness and learning that took place during the fourteenth and fifteenth centuries, particularly in Italy, but also in Germany and other European countries. The period was characterized by a renewed interest in ancient Greek and Roman art and design and included an emphasis on human beings, their environment, science, and philosophy. (Artlex.com) and BaroqueThe art style or art movement of the Counter-Reformation in the seventeenth century. Although some features appear in Dutch art, the Baroque style was limited mainly to Catholic countries. It is a style in which painters, sculptors, and architects sought emotion, movement, and variety in their works. (Artlex.com) decoration. Here it is used in the simplified popular artLow (as opposed to high) culture, parts of which are known as kitsch and camp. With the increasing economic power of the middle- and lower-income populace since the beginning of the Industrial Revolution in the nineteenth century, artists created various new diversions to answer the needs of these groups. These have included pulp novels and comic books, film, television, advertising, "collectibles," and tract housing. These have taken the place among the bourgeois once taken among the aristocracy by literature, opera, theater, academic painting, sculpture, and architecture. But modernist artists rarely cultivated the popular success of these new cultural forms. Modernist works were little appreciated outside of a small elite. Life magazine's 1950s articles on the abstract expressionist Jackson Pollock (American, 1912-1956), and the silkscreened paintings by Andy Warhol (American, 1928?-1987) of soup cans and celebrities signaled unprecedented fusions between high and low art and the transition to the postmodern age. (Artlex.com) styleA way of doing something. Use of materials, methods of working, design qualities and choice of subject matter reflect the style of the individual, culture, movement, or time period. used by Didur. The optical illusionAn image that deceives a person, leading to a misinterpretation of its meaning. Optical illusions can be found in nature as well as in art. Their strengths rely upon various assumptions in which humans perceive optical phenomena. (artlex.com) For some examples, go to: Optical Illusions and Visual Phenomena: http://www.michaelbach.de/ot/ The World of Optical Illusions: http://www.newopticalillusions.com/ NIEHS Kids Page – Optical Illusions: http://kids.niehs.nih.gov/illusion/illusions.htm Didur uses emphasizes areas of the paintingWorks of art made with paint on a surface. Often the surface, also called a support, is either a tightly stretched piece of canvas or a panel. How the ground (on which paint is applied) is prepared on the support depends greatly on the type of paint to be used. Paintings are usually intended to be placed in frames, and exhibited on walls, but there have been plenty of exceptions. Also, the act of painting, which may involve a wide range of techniques and materials, along with the artist's other concerns which effect the content of a work. (Artlex.com) as seeming to be three-dimensional, but within these areas are flat illustration-styled imageryAn image is a picture, idea, or impression of a person, thing, or idea; or a mental picture of a person, thing, or idea. The word imagery refers to a group or body of related images. (Artlex.com) that makes us think of children’s book illustrations. Create one or two simplified images of objects such as cars or other vehicles, action figures, animals, trees, flowers. Expand your ideas into a compositionArrangements of elements in a work of art. using repetition, levels, and angles. This could be pictorialOf or pertaining to pictures; illustrated by pictures; forming pictures; representing with the clearness of a picture; as, a pictorial dictionary; a pictorial imagination. (The Online Plain Text English Dictionary) or set up as a designA plan, or to plan. The organization or composition of a work; the skilled arrangement of its parts. An effective design is one in which the elements of art and principles of design have been combined to achieve an overall sense of unity. Also [applied design], the production of attractive and well crafted functional objects. Subcategories of the design arts include: architecture, bonsai, fashion design, furniture design, graphic design, ikebana, industrial design, interior design, landscape architecture, stagecraft, textile design, and Web page design. (Artlex.com) (like a pattern). Select a limited paletteA slab of wood, metal, marble, ceramic, plastic, glass, or paper, sometimes with a hole for the thumb, which an artist can hold while painting and on which the artist mixes paint. Anything from ice trays to disposable paper or Styrofoam plates might be used as a palette. A pane of glass with a white piece of paper attached to its underside makes a fine palette. It's especially versatile because the color of the paper back can be made to match a painting's ground, making colors easier to choose. The term "palette" may also refer to the range of colors used in a particular painting or by a particular artist. (artlex.com) of colours using intense colours similar to those used by Didur. Choose your own paints or drawingDepiction of shapes and forms on a surface chiefly by means of lines. Colour and shading may be included. A major fine art technique in itself, drawing is the basis of all pictorial representation, and an early step in most art activities. Though an integral part of most painting, drawing is generally differentiated from painting by the dominance of line over mass. There are many sorts of drawing techniques, varying according to the effect the artist wants, and depending on whether the drawing is an end in itself — an independent and finished work of art -- or a preliminary to some other medium or form — although distinct from the final product, such drawings also have intrinsic artistic value. Preliminary drawings include various exercises (e.g., contour drawing, gesture drawing, figure drawing, drawing from the flat), as well as sketches and studies, cartoons and underdrawings. (Artlex.com) media. Select one area of your art piece that could be cut into a smaller square or rectangle. Scan your selection into a computer. Print it onto a fabric transfer sheetSpecially designed paper from which you can iron a design onto a piece of fabric. and iron it onto t-shirt. Alternatively, enlarge one square of your art piece to create fashion ”patches” to iron onto jeans. You could also repeat your printed sheet to create a “fabric” patternRepeating lines, colours or shapes within a design. to use in designing a fashion accessory, creating a CD cover, or designing background for a music poster. Author unknown. Jerry Didur. Saskatchewan Arts Board. Retrieved from the internet on January 21st, 2008 at http://www.artsboard.sk.ca/showcase/FromFartoNear/FFtoN_3.htm.